Dave Adair Photography: Love, and its location. The room is cool and quiet, with only the sound of soft, almost silent breathing. The walls are a non-offensive light brown color, and the carpet absorbs sound, adding to the quiet. No light comes through the windows, since it's late at night. I'm just waking up, at midnight, after an exhausted nap. My brother says, "You might want to come - it's getting close." The breaths are getting shallower, and further apart. With the exhale of each breath, and then the long pause, we're wondering if it might be her last. And then, it is. My mother's body, now lifeless, apparently, lies still, in stark contrast to the unexpected animation and joking and love of the last nine days in hospice. I wonder: if she's not here, apparently - where is she? And if she's not here now, how do I know she was here before? What I don't wonder about: love, and its location. We're swimming in it, before and now, in this hospice room, in the hospital stays, in the restaurants and hanging out, talking and non-talking and in-between. We're swimming in it. p.s. I'm flying with Jen to Kathmandu, Nepal on Sunday, the first time I've been in nine years. Our Romanian traveler friend, Catalina. What am I, some kind of frickin' donkey whisperer or something?! It's almost like they're not stubborn around me - but that's crazy talk. Two distinct groups of tourists come to Bir: meditation-types and paragliding-types. Fun-scary. I didn't try it, but might on another trip. The beautiful shale roof of a small barn. We had the bad idea to hike down from the top of the paragliding take-off point. My knees regret that decision. 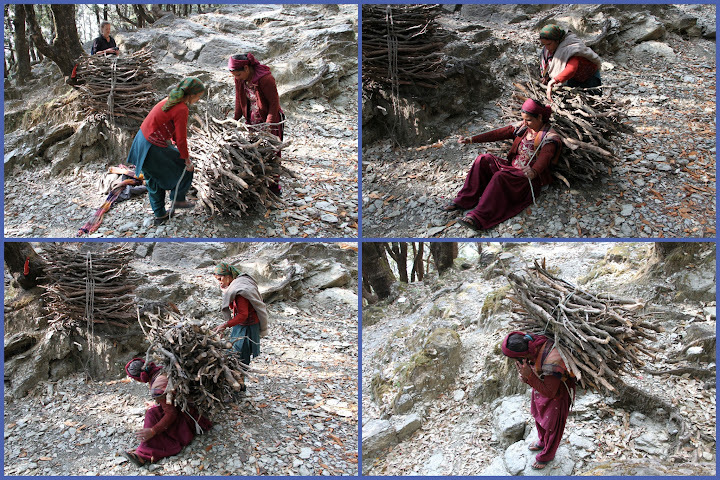 We came across two women carrying large loads of wood down the hill. Yeah, but my knees! I'm on vacation and my knees hurt! Just after she gets her bundle up and positioned on her back, her mobile phone rings, which you see in the last frame. "One ringy-dingy! Two ringy-dingy! Is this the party to whom I am speaking?" Another delightful stroll through fields and villages today. People are SO friendly. I'm Dave Adair, and I approve of this picture. This beauty was walking with her grandfather. Adorable. We met a man, woman, and child riding a motorcycle, and they invited us into their home. They're both teachers and speak quite good English. They were happy to talk about both the benefits and challenges of their traditional Indian life. They wanted us to stay for dinner, and when we declined, they insisted that we come back next trip. OK! This woman was part of an extended green-eyed family that were happy to chat with us. These sisters could not stop giggling.